I've read a lot of books this year, just like I always do, but none of them were truly fantastic. Most fell into the mediocre to ok range. A few were good and a few were total duds. That changed when I read Ink and Bone. It's easily my favorite book that I've read this year so far. I knew almost nothing about it going in except that I had liked some of the author's work before and by the end of the book I wanted to know what happened next! Rachel Caine does a great job kicking off a new series with Ink and Bone. 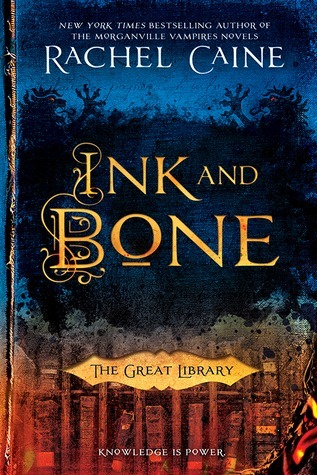 Ink and Bone is set in a world where the library of Alexandria never burned. It continued to grow in both scope and power until it controlled all knowledge in the world. All technological advancement had to come from the library and so this alternate timeline finds a much different world than the one we live in. The printing press has been suppressed and instead people have to check out books into "blanks" that function similarly to a modern day kindle. The printed word is not widely available in any other form, so the library controls information throughout the world. The main character in Ink and Bone is a book smuggler's son. He starts to learn the trade of smuggling real books in a world where it's illegal to own them. After realizing it's not the right fit for him his father pushes him to join the Library so they can have a member of the family on the inside. The adventure takes off from there and never really lets up. I loved so much about this book. The pacing, the characters, the world-building, the writing style, the plot itself. Like I said, as soon as I finished Ink and Bone I immediately looked to see if there was another book in the series. There was! So I bought and downloaded it immediately. Expect me to blast through that one as well and do a write up soon.